There is currently no enjoyable bike infrastructure connecting the Southwest Corridor to the Boston Commons. Columbus Avenue has some bike lanes and sharrows, but for the most part a route for biking has not been made leading to the Commons. Cyclists that wish to ride to the Commons from the South End, Jamaica Plain, or the other communities adjacent to the Southwest Corridor are currently forced to ride in mixed traffic for much of the route due to the lack of bike infrastructure away from the Corridor. While brave cyclists are willing to cycle in mixed traffic, children and people traveling with children are less willing to cycle directly next to cars. In order to add a connective, low-stress bike route safe enough for families to ride, a path starting at Carleton Street and Yarmouth Street by the Southwest Corridor and continuing to the Commons via Charles Street is proposed. Along the way, the route runs through a block of Columbus Avenue, all of Chandler Street, and a section of Tremont Street. This route will then connect to both the proposed cycle tracks around the Public Garden and the existing cycle tracks within the Boston Commons. From there, another student group is proposing a connection leading from the Commons at Charles Street and continuing to the Esplanade. Connecting these projects, a bicycle route could be created leading from Southwest Corridor and continuing all of the way to the Charles River Esplanade. The interactive map below gives the route; the mixed use roads are in red and the separated cycle tracks are in green. Above is the proposed entrance and exit to Carleton Street from Southwest Corridor. Modifications include, a smoother transition from sidewalk to road for cyclists and signage to signal to bicycles the presence of a bike route. Carleton is currently a quiet, low-stress street with no on-street parking due it being a narrow street with a higher than standard curb height. The road will make for an excellent connection to Yarmouth Street with no modifications needed to its street profile. Through using Carleton Street, bicycles will not have to share the sidewalk with pedestrians until Yarmouth Street and can instead transition to the faster and safer parallel road. Yarmouth Street is currently a quiet, one-way street with parking along both sides and a 19’ wide travel lane with a speed limit of 25 mph. We propose to turn Yarmouth Street into what the Dutch call a fietstraat. This means that we will be making a street where cyclists ride in both directions in mixed traffic. Since Yarmouth is a low-volume residential road, it is safe to mix cycle and motor vehicle traffic. We will leave the parking along both sides as residents use all the on-street parking on Yarmouth, but we will add a 2’ buffer of grey pavers next to both sides of parking to help with the threat of being doored. This allows for two, 5’ red zones suggested for bikes and one 5’ black zone in the middle. These areas are suggestions, yet cyclists will likely ride on the side of the road, in the red areas. Cars ride in the center of the road until a cyclist approaches. Once they meet, the car moves away from the cyclist, even if it means moving into the opposite red zone. The combination of the central zone and a single red zone is wide enough to fit a car. Since Yarmouth is slow speed road, a car can ride behind a cyclist for a short time if there are cyclists in both red areas and there is not enough room for the car to get by. In the end, the modifications will beautify the street while not impeding on the flow of car traffic. The existing and proposed conditions on Yarmouth Street are shown below. To connect Yarmouth Street to Chandler Street and the rest of the route, Columbus must be crossed. In existing conditions, Columbus Avenue has one lane of travel in each direction, separated by a seven foot wide cobble median. Parking is provided on each side, as are five foot wide bike lanes. At the Dartmouth Street intersection, the parking is replaced with right turn lanes while the bike lanes vanish. The existing Columbus Avenue design and its problems are shown below. Existing bicycle infrastructure provides bicycle lanes on both sides of Columbus Avenue from Yarmouth street to Chandler Street; however, the bike lanes are not satisfactory according to Dutch standards. The bike lanes are located on a busy road and next to a parking lane without a door zone buffer resulting in a relatively high-stress cycling facility. The existing bicycle infrastructure does, however, provide a path from one end of columbus to the other and we do not want our proposed design to disrupt or create a break in that existing infrastructure. 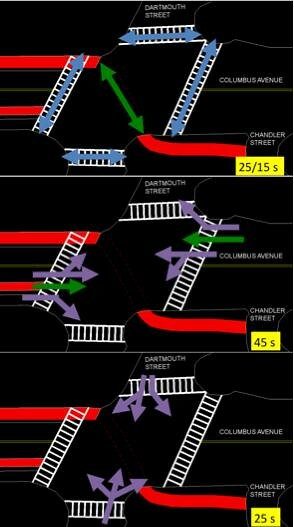 When deciding what to do for the Yarmouth-Chandler connection across Columbus, we weighed the effectiveness of three different alternative designs. Alternative 1 proposes an 8-foot 2-way cycle track from Yarmouth to Chandler on the east side of Columbus Avenue to easily connect with the turn from Yarmouth Street. We will also keep a 5-foot bike lane adjacent to the 7-foot parking lane on the west side of Columbus Avenue with a 3-foot door zone to connect/continue to the existing infrastructure on Columbus Avenue. This solution provides a narrow cycle track and narrow parking spot but still fulfills the requirements for space needed. It does not cut into the existing curb which has trees and streetlights that would need to be cut into and makes the bike lane safer with the added 3-foot buffer. Alternative 2 proposes a 10 foot 2-way cycle track from Yarmouth to Chandler on the east side of Columbus Avenue to easily connect with the turn from Yarmouth Street. It also keeps a 5-foot bike lane adjacent to the 7-foot parking lane on the west side of Columbus Avenue with a 3-foot door zone to connect/continue the existing infrastructure on Columbus Avenue. This solution solves two problems; we’d have a low-stress facility connecting Yarmouth Street to Chandler Street and we’d keep the existing infrastructure intact. Ideally, the 2-way cycle track or 1-way cycle tracks on both sides of the street would extend throughout the length of Columbus Avenue but the rest of Columbus Avenue is not currently in our scope. The disadvantage to this proposed cross section is that it cuts 3 feet into the curb and would require the removal and/or resetting of trees and light poles. Alternative 3 proposes a 12-foot 2-way cycle track from Yarmouth to Chandler on the east side of Columbus Avenue to easily connect with the turn from Yarmouth Street. We’ll remove the bike lane on the west side of Columbus Avenue as it does not meet Dutch standards. This solution leaves the curb untouched but also breaks the current bike lane infrastructure on Columbus Avenue. 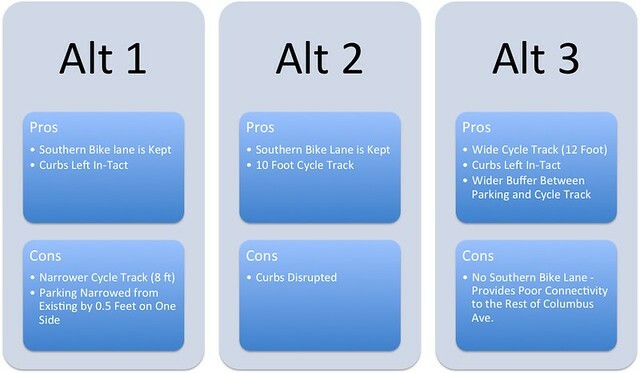 The table above displays the pros and cons for each proposed Columbus Avenue solution. Alternative 2 disrupts the existing curbs, bumping up cost tremendously, while Alternative 3 disrupts the connectivity of our route with the rest of Columbus Avenue. Because of these two flaws, Alternatives 2 and 3 were disregarded and we moved forward with Alternative 1. With this design, car behaviors will most likely remain unchanged. However, removal of the central median could slow speeds as drivers will now be riding directly next to oncoming traffic instead of next to a wide cobble median. Northbound cyclists, on the other hand, will now be given a choice to ride in the safer two-way cycle track on the north side of Columbus or stay in the bike lane on the south side. Cyclists heading southbound will need to briefly transition from bicycle lanes to the proposed two-way cycle track and back to bicycle lanes. To connect the Yarmouth Street and Chandler Street fietstraats, the bike route needed to shortly travel along Columbus Avenue which poses a problem due to Columbus Avenue’s higher amounts of traffic. As stated, a two-way cycle track will be built on the north side of the street. The cycle track is two-way to accommodate cyclists traveling in both directions. The two-way cycle track adds a path feel to the section; the user does not feel that they are riding next to a busy road because of the separation between the cycle track and the road. This path feeling is much lower stress than bike lanes, which makes the path ideal for children and less experienced cyclists. At the Dartmouth Street intersection, the cycle track will cross diagonally across the intersection. A separate signal for cyclists must be installed to protect the cyclists because they are essentially crossing two streets at once. A waiting area at both ends of the intersection will accommodate cyclists waiting to cross the intersection, as well as cyclists wanting to continue along the street. Because this intersection is already signalized, the bikes can be put on the existing all-pedestrian phase. At this intersection design, cyclists also only conflict with pedestrians once. Pedestrians at this point will yield to cyclists, indicated by shark teeth pavement markings. To add protection to cyclists, bollards will be added to the northern waiting area so that cars turning right from Dartmouth to Columbus do not cut the corner too closely. To add bollards, two parking spots will be taken out at that corner of Columbus Avenue. Two parking spots will also be taken at the pedestrian area connecting to Chandler Street to give the pedestrians a larger waiting area. This removal of parking is insignificant compared to the amount of parking along the entire street, and this removal creates a safer space for both cyclists and pedestrians. The parcel of land the cycle track cuts across as they enter Chandler Street is owned by the city of Boston. A cycle track will be added to it to connect cyclists to Chandler Street. It seems this land was put there as a traffic calming measure to prevent cars from cutting from Columbus Avenue to Chandler Street to protect pedestrians. However, when this sidewalk was built, no consideration for cyclists using the street as a connection was provided. Using this section as a low stress measure for cyclists to avoid the intersection solves both the problem of cyclists traveling through the intersection and the lack of connection to Charles Street. The above diagram shows the three proposed phases for the Dartmouth/Tremont intersection with the phase time displayed in the bottom right (a maximum time of 95 seconds). The signal at the Dartmouth and Tremont intersection currently features 3 phases: an all pedestrian phase, a Columbus traffic phase, and a Dartmouth traffic phase. This redesign will keep the existing phases, as shown above. The only difference is that the all pedestrian phase will be joined by the diagonal cycle movement across the intersection. Additionally, the pedestrian/cyclist phase will not always occur. If nobody needs it, that phase is skipped. However, advanced and stop line loop detection placed in the cycle track on both approaches will tell the signal that a cyclist wants to make the diagonal movement and therefore the phase can’t be skipped. Likewise, if a pedestrian presses a push button the phase will run. The phase can be shortened if a pedestrian does not activate a push button, but a bike is detected. In this case, the phase will only be 15 seconds for cyclists as opposed to 25 seconds for both cyclists and pedestrians. The intersection design is inspired by the intersection found on Vredenburg in Utrecht, pictured below. Similar to the intersection in Utrecht, cyclists ride directly across the road on their own signal phase to avoid having to cross the street twice. Chandler Street is currently a one-way street that flows out onto Columbus Avenue, but becomes two-way to the east of Berkeley Street because it becomes a dead end. It contains parking along both sides and has a 25’ wide travel lane. Chandler Street will be receiving the same treatment as Yarmouth Street, becoming a fietstraat. Parking will remain on both sides and a 3’ buffer of grey pavers to prevent being doored will be added. This allows for two 6’ red zones suggested for bikes and one 6’ black zone in the middle. Cars have plenty of space to maneuver around cyclists. When Chandler Street ends, bicycles will continue on the pedestrian path that connects to Tremont Street. 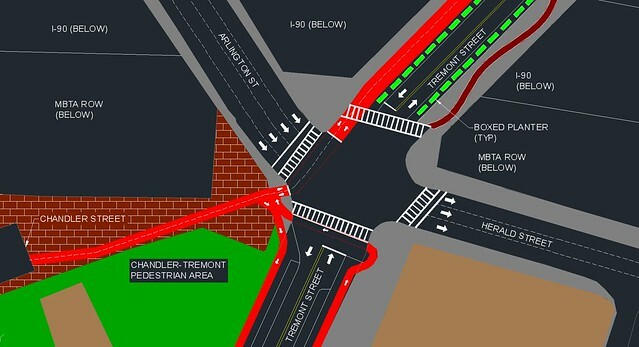 To connect Chandler Street to the proposed cycle tracks on Tremont Street, the pedestrian area between Tremont Street and Chandler Street will be used. Because the cycle track remains on top of the curb until the intersection, no additional protection for the cyclists is necessary because cars will avoid driving up on the curb. On the other side of the intersection, protection is not necessary because cars will not be turning right because Arlington Street is a one-way street. Because this intersection is already signalized, the cyclists crossing from the Chandler path to Tremont Street can be on the same phase as the pedestrians. In addition, this segment of the Chandler-Charles cycling path connects to another group’s improvements on Tremont Street by tying in to the one-way cycle tracks in their design. Cyclists that want to travel from Chandler Street to go south down Tremont can easily make a right down the cycle track. Likewise, people traveling from the Tremont Street bridge who want to go south can cross the street and continue down the path leading down Tremont Street. The movement to continue traveling north on Tremont Street, however, may take more time because cyclists have to cross the street twice. Tremont Street crosses over I-90 after the intersection of Arlington Street and Herald Street. The current bridge is 4 lanes, each 15 feet wide with 11-foot sidewalks on both sides. There is no bike infrastructure on this bridge. The existing conditions of the bridge are shown below. We proposed to give this bridge a road diet, changing from a 2+2 lane road to a 1+1 lane road with a 14-foot two-way cycle track on the west side of the bridge. There will be a 7-foot buffer in the form of planter boxes between the cycle track and the cars. We have also made the driving lanes narrower, from 15 feet wide to 11 feet wide. A 5 foot buffer of hedge will be added to the east of the driving lane. The 11 foot sidewalk to the west will not be touched, but the sidewalk to the east will now become 25 feet wide and will be used to add art to the bridge. Adding art to the bridge will take people’s eyes away from the highway beneath them and make the bridge more enjoyable to walk along. Sound barriers will also be added to both sides of the bridge to make walking more enjoyable. Tremont Street currently has a very wide, unlaned travel area with parking provided on both sides. The wide, straight road encourages fast speeds as cars are given much more space than they actually need. As of today, no bike facilities exist on this section of Tremont Street, and only the bravest cyclists dare ride there. The existing conditions of Tremont Street are shown below. Two alternatives were considered for the Tremont street section of the route. To improve low-stress cycling in the Tremont street section of the route, our first proposal has a 12 foot wide cycle track that will continue on the west side of the street. The cycle track will be separated by a 3 foot buffer so that cyclists avoid the risk of being doored by parked cars. Narrowed lanes will discourage the fast driving that occurs today, and keep drivers in a more concrete area, making vehicular travel safer. At minor intersections with roads, Church Street and Jefferson Street, the cycle track and median will continue through the intersection and cars will be forced to traverse the raised crossing. In doing so, cars will know that they must yield to pedestrian and bicycle traffic. In addition, cars will approach the crossing with slowly due to their change in vertical position. Our second proposal for Tremont Street had two one-way cycle tracks on each side of the street. This causes bikes heading north to have to cross Tremont Street to continue along Charles Street, which is less ideal. Due to this, we will move forward with proposal one to avoid this crossing, and to connect to the two-way cycle track that would be on the west side of the bridge already. This also continues the path feel that we want to have. The table below displays the pros and cons for each proposed Tremont Street cross section. After weighing the pros and cons of each alternative we moved forward with alternative 1. Our proposal proposes cycle tracks along Tremont and in a few other locations. Above is a typical curb profile of a cycle track. The sidewalk is set six inches above the road and the cycle track is set two inches below the sidewalk. 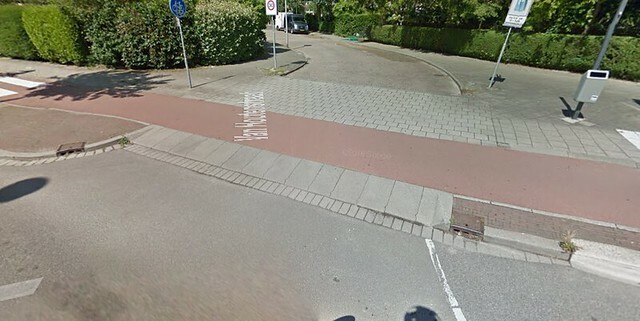 The vertical separation of sidewalk, cycle track, and road makes it clear where users are supposed to be. The cycle track is bordered a sloped curb so that errors made by cyclists do not result in injury. The four inch curb between the cycle track and the road makes extremely difficult for motor vehicles to invade cyclists’ space. Charles street is currently a three lane, one-way road with unnecessary capacity. Charles Street is fed by one lane of traffic from Tremont Street where a good portion of traffic splits off at Charles and Tremont intersection. In other words, less than one lane of traffic is feeding three lanes on Charles Street. As a result, the road can easily be reduced to one lane. The existing conditions are shown above. Similar to Tremont Street, two alternatives were considered in the design. These alternatives were directly related to the Tremont alternatives. For a portion of Charles Street, from the intersection with Tremont Street to Stuart Street, we are proposing to shrink the road to one lane. We added a 12 foot wide two-way cycle track that would continue from Tremont Street, along with two 6 foot wide planter boxes on medians, on each side of the parked cars to beautify the street and to separate car traffic from bicycle and pedestrian traffic. The sidewalks will remain intact. Similar to Tremont Street, at minor intersections, the cycle track and median will continue through the intersection, signaling that cars are entering pedestrian and bicycle space. Our second proposal has two one-way cycle tracks on each side of the street. This would not flow well with our Tremont Street design so we did not continue with this design. Stuart Street intersects Charles Street two blocks north of the Tremont-Charles intersection. At the Stuart Street intersection, traffic funnels onto Charles Street heading north. Because of this influx in traffic volume, Charles will leave the intersection with two 10.5 foot wide travel lanes. This also makes it easier for traffic to continue while cars turning left onto Park or right onto Boylston partially block a lane. These two travel lanes continue all the way to the Boylston intersection where one becomes a dedicated through lane and the other becomes a through/right turn lane. 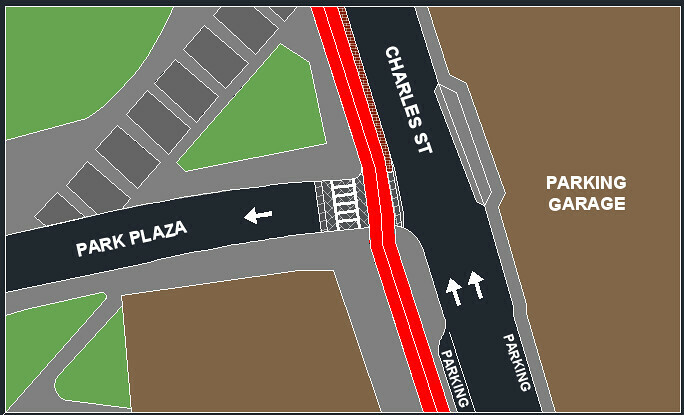 At the Stuart Street intersection, the cycle track will be raised and cars will need to come to bicycle level to continue on Stuart Street or to turn onto Charles Street. At the part of Charles Street where the cycle track crosses Park Plaza, the cycle track will be raised to match the grade of the sidewalk. The raised crossing will slow cars down as they enter Park Plaza. This raise in the cycle track is necessary due to the large amounts of motor vehicle traffic turning onto Park Plaza from surrounding parking garages and Stuart Street. Shown above is a raised crossing at a side-street on Ruys de Beerenbroukstraat, Delft. You can see that the cycle track matches the grade of the pedestrian crossing and is raised a noticeable amount above the travel lane. 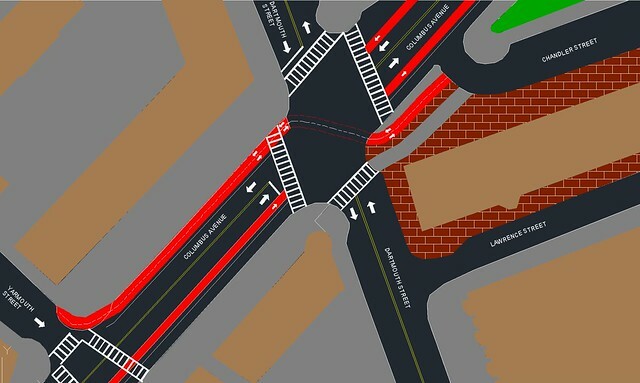 The change in brick pattern as well as the variation of red asphalt and concrete tiles aid the motorists identification of the “zones” within the intersection. The first layer of concrete tiles identify the raise to the crossing while the red asphalt and patterned tiles identify the vulnerable movement zones. Though our project scope ends where Charles Street meets Boylston Street, we were asked to provide a connection to the proposed cycle track around the public garden and the existing bicycle infrastructure in Boston Common. The primary complication with this intersection involves connecting our proposed cycle track with the other existing/proposed bicycle infrastructure with as few altercations with pedestrian movements as possible. We also attempted to keep the disruption to motor vehicle traffic movements minimal throughout the intersection. Finally, the proposed design aimed to utilize the existing pedestrian traffic light movements to our advantage and minimize waiting time for all modes. Our proposed Charles Street cross section ends with a 12-foot cycle track on the west side of the street bordered by a 3 foot concrete median. This cycle track will continue on the left/west side following the pedestrian movement through the intersection. To accomplish this movement, the pedestrian crosswalk was replaced with the cycle track and moved further west of the cycle track crossing. There are pedestrian crossing islands in the middle of the intersection and at the yield-point for cyclists at Boylston street that the cycle track can utilize if the light is short and/or cyclists are forced to wait and yield to other cyclists. We’ve also suggested an addition to the proposed cycle track around the garden at Boylston street; a left-turn waiting lane for cyclists within the cycle track. This waiting zone, in addition to the waiting zone adjacent to the curb should provide enough queue space for cyclists waiting at the intersection. This path provides the connection to the proposed cycle track at the public garden. We considered two alternatives connecting our proposed Chandler/Charles connection to the existing infrastructure at Boston Common. Our first design followed the eastward pedestrian movement through the intersection. There were a couple complications with this design. First, the cyclists would have to wait for the Charles street motor vehicle movement at the first crossing island, and could potentially have to wait again while crossing the Boylston street motor vehicle movement. This design also required altercations with the cyclists and pedestrian movements. Therefore, we decided on our second design as shown above. 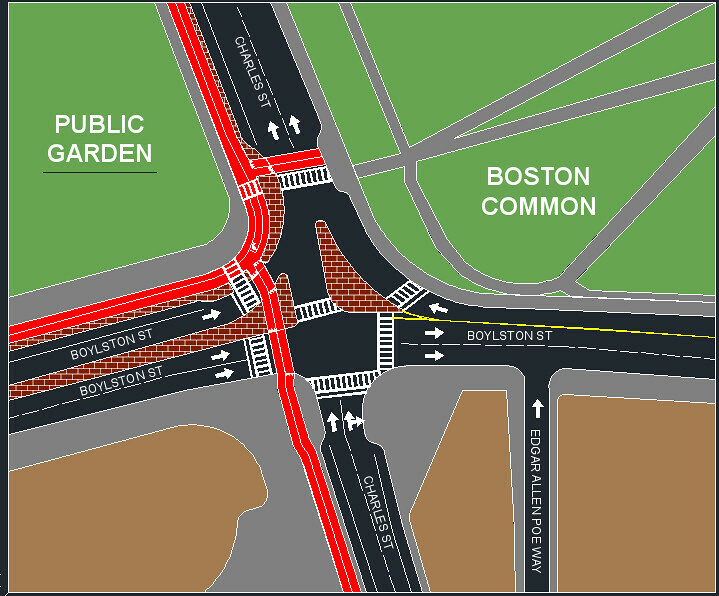 The cyclists will continue through the intersection to connect to the proposed cycle track around the public garden and utilize the pedestrian crossing further down Charles Street, past the intersection, to cross to the Boston Common bicycle infrastructure. This movement does not require any additional traffic light changes nor does it conflict with pedestrian crossing movements. Additionally, because of the proposed parking lane on Boylston Street and Charles Street, we could provide a brick protective island and waiting for the cyclists crossing to the commons. 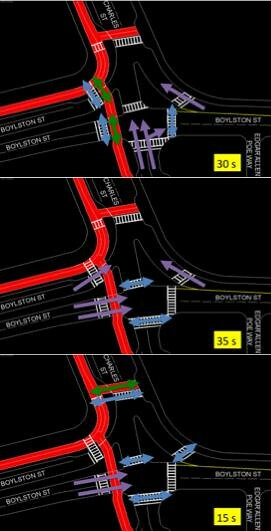 The above diagram shows the proposed signal phasing for the Boylston/Charles intersection. 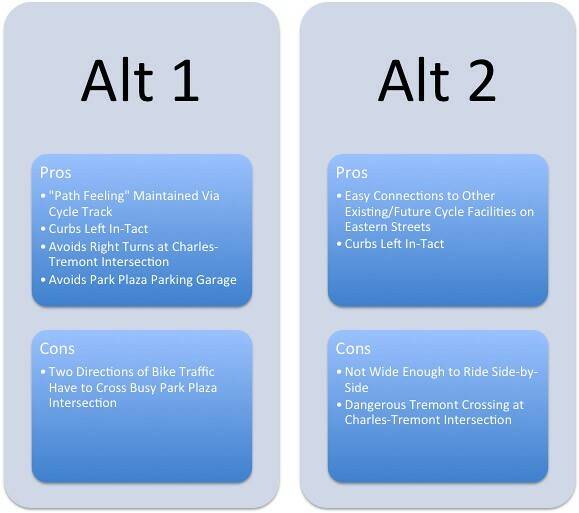 There are three total signal phases: one for the Charles through traffic (and cycle track movement), one for the Boylston through traffic that allows for turns onto Charles, and one for Boylston through traffic that does not allow turns onto Charles so that pedestrians/cyclists can cross between the Public Garden and the Commons. The time for each phase is shown in the bottom right in each diagram, with a total time of 80 seconds. The bike and pedestrian signals, even if they are not being used, will still activate in the right sequence. Shown above is the right-turn movement on Oostingel, Delft. The cycle track widens to provide enough room for three lanes of cyclists. At this point there is a North and South movement for cyclists as well as a right-turn lane for cyclists queuing for the right turn across the street. Above is the cycle track at Jaffalaan, Delft on the way to TU Delft. The cycle track remains red through the intersection to identify where the cyclists will be travelling. The white triangles identify who has the right of way at the intersection. Here, the cyclists are given priority; however, at the proposed Charles Street intersection, the motor vehicles are given priority while the cyclists should be waiting for their green light. Our proposal, in combination with another student group’s project on Charles Street, provides a direct connection to Longfellow Bridge for bicycle commuters traveling to and from Cambridge. However, cyclists wishing to continue along the Charles River Esplanade towards Allston will not prefer to travel all of the way to the Longfellow Bridge. Evidently, there is a missing connection on Beacon Street at the Arthur Fiedler Footbridge. 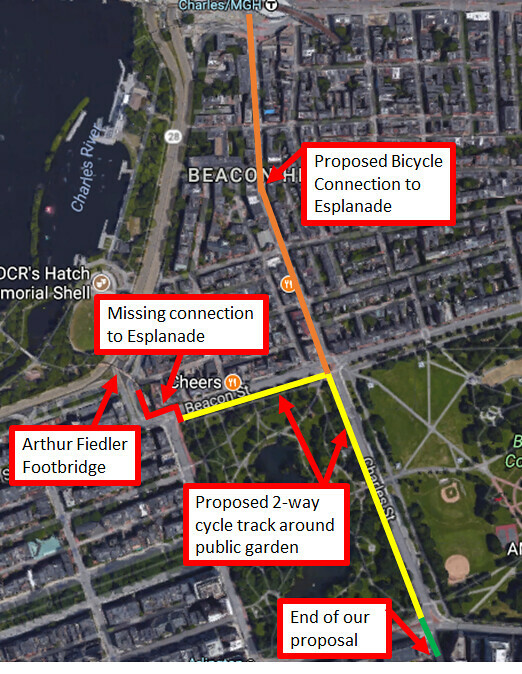 Thus, we recommended creating a safe bicycle connection from the proposed 2-way cycle track around the Public Garden to the Arthur Fiedler Footbridge. We learned that focusing on just the area that we need to improve on is not the proper mindset to have. We needed to see the bigger picture and make connections to other bike networks to improve not only the area that we were working on but also the network as a whole. If the network does not properly flow, then improving streets lacking infrastructure is less effective. The big picture does not only involve the bike network; we also have to take into account pedestrians and the community as a whole. With all the space provided on these wide streets, we have the opportunity to add bike infrastructure as well as art or planter boxes to make the street more attractive so the community enjoys the space more, not just cyclists.